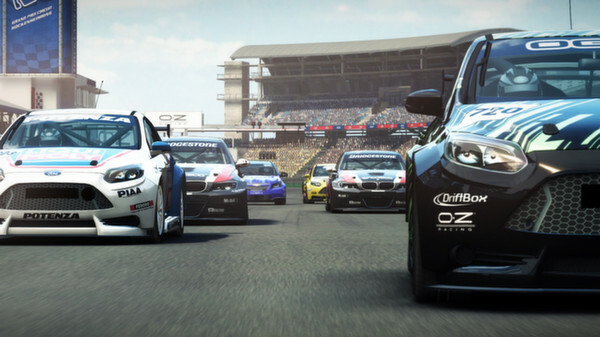 Helmets at the ready, as GRID Autosport will be screeching onto our favourite SteamOS & Linux platform this December. Good news: It supports Intel, AMD and Nvidia graphics! Requires Nvidia 600 series, AMD 6000 series, Intel Iris Pro or better. After emailing Feral Interactive as their mini-site and newsletter stated different requirements, they have edited their mini-site to only list Nvidia once again. It will also support cross-platform multiplayer, so that's very good news. I can't wait to thrash some Mac gamers! It's only a week away, and it's much sooner than I expected it to be released which has me rather happy! I will more than likely do a special livestream on the release day Thursday the 10th of December to celebrate. Be sure to follow my personal livestreaming page in Twitch. As usual, I urge you not to buy it until the official release to be sure our porting friends get the money they deserve for bringing another wonderful game to our small platform. It’s all about the teams, the rivals and the race in an intense new world of professional motorsport. Racing alongside a teammate, you must overcome key rivals and satisfy team sponsors in ferocious races where every pass and position counts. Players will get behind the wheel of 80 highly desirable rides including front-wheel drive hot hatches, souped-up Muscle cars, lightweight open-wheelers and 1,000 horsepower hypercars, by manufacturers including Jaguar, McLaren, Pagani and Aston Martin. They’ll put these wonderful vehicles through their paces on 22 speed-friendly locations around the world, including purpose-built circuits such as Spa-Francorchamps, Brands Hatch and Yas Marina, and the exhilarating city street circuits of Barcelona and San Francisco. I have updated our Release Calendar to reflect the release date too! Yeah, I was waiting for that! Really nice! Now, if we can also get Dirt Rally my racing needs would be completely satisfied. oh boy, this level of supported hardware is fantastic! they actually already were fantastic as they edited the requirements with a big disclaimer. At the moment it is available to buy in the Humble Codemasters Bundle! Won't count as linux sale though? raverrebel At the moment it is available to buy in the Humble Codemasters Bundle! Like I said in the article, don't buy before a port is out. Always follow that simple rule. Excellent news! This will be the first major racing simulation game on Linux. I thought Project CARS come out first, but it seems that their team has missed the premiere. Update: After emailing Feral Interactive as their mini-site and newsletter stated different requirements, they have edited their mini-site to only list Nvidia once again.